tAKing THE MYSTERY OUT OF THE MARKETING MIX! It's called the marketing MIX for a reason. The right mix of promotional activity for your business depends on your who customer is, where they look for information and who they trust to make recommendations. In many ways, the idea is simple; but then when we start throwing in all the marketing jargon of 'brand story', 'value proposition', 'empathy mapping'and 'click funnels'; not to mention all our favourite acronyms like SEO, PPC, CRM and ROI; suddenly it all feels like a complicated and potentially EXPENSIVE process. This is where the Map of Marketing comes in! You wouldn't set out on your travels without planning the route on a map, so why should your marketing journey be any different!? 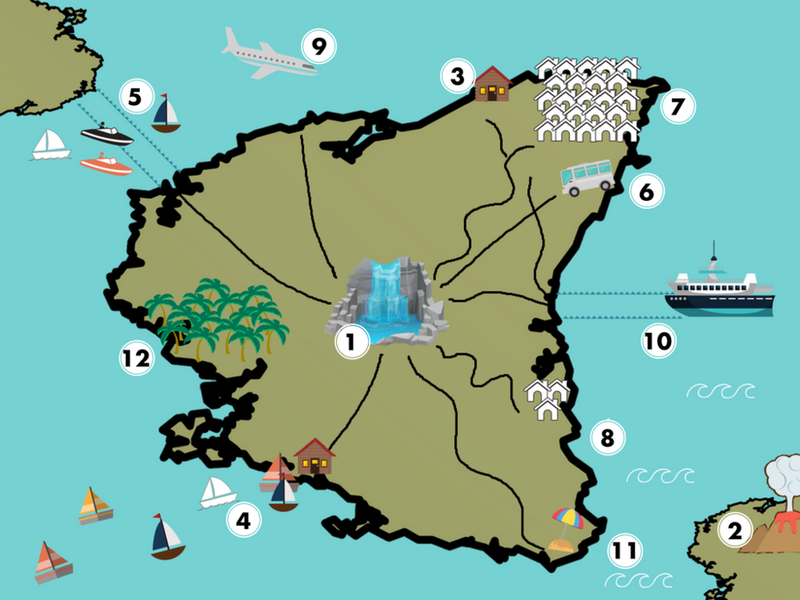 The WOW Waterfall is at the heart of the island - it's a must see (like your business!). How are your customers going to find it and get there!? THE MAP IS A FUN, SIMPLE WAY OF EXPLAINING THE MARKETING CHANNELS WITH NO JARGON EXPLANATIONS - PERFECT IF YOU'RE A MARKETING NEWBIE! Why not apply the channels to your own business and see how you can develop your marketing mix.